As Christmas approaches, folks often stop and think of the warm memories of family, food and presents wrapped and waiting under a tree. I often wonder if those who knew my family shudder in their remembering as they think of the two little heathen hillbilly youngin’s my folks raised. Christmas was a perfect season for little boys to get into trouble. We did our best, though, as we tried to be good and stay on Santa’s “good boys and girls” list. Getting up at 3:00 am on Christmas morning doesn’t count. We made it past Santa’s visit, so we were okay! Smelling the perfumed Avon hand cream, telling Mama how good it smelled and then pushing it up and into her nose AND nostrils as she smelled it is something that could have been an accident. What hounded me, what haunted me each year of my childhood were four red elves made of ceramic. They each held their bodies in poses worthy of an acrobat as they formed the letters “NOEL” with their arms, legs and bodies. Mama would sit them on the mantle at Christmas where they would call to me, mock me with their little painted on smiles and oh so perfect spelling… “NOEL”. At some point every year I would sneak in and rearrange the elves to spell “LONE”. Sometimes it took days, other times just hours for Mama to see the rebel elves and rearrange them correctly. I would rearrange them time after time, sometimes dozens of times in one Christmas season. It was a battle to see who eventually won on Christmas Eve. I went to bed more than once giggling because I knew Santa would see “LONE” as soon as he came down the chimney. More than once I rushed into the living room and found the elves rearranged to “NOEL”, apparently by Santa himself. Even into my high school and college years I fought the battle with the elves and would rush home from college just to change their twisted bodies to my rebellious “LONE”. There was something like poetry in it. I felt like the beatnik poet standing before an unappreciative crowd reading a cerebral piece few understood and fewer respected. Mama was never sure exactly who did it. It was a silent battle fought on the mantle of our home. For most of those years I didn’t think Daddy even knew. I thought he just didn’t notice. I thought that until 1977, the year after Daddy and Mama moved to Cherokee Lake in Tennessee to enjoy an early retirement. As we all aged, our family no longer gathered as we did years before. I try to be the one who holds the families of our clan together with calls, visits and planned parties. It became more difficult as children and grandchildren grew up and scattered. Knowing that my folks couldn’t be with the rest of the family for Christmas was always sad and back in ‘77 I decided to spend a few days with them before Christmas day. As I sat with Daddy and watched a program on TV, Mama hurried out the door to get to the grocery and buy all the fixings for a huge ham dinner. We sat watching the TV for about 30 minutes after she left. Daddy finally looked over with a crooked smile and said, “Well, you better get to work if you are going to do anything with them elves”. 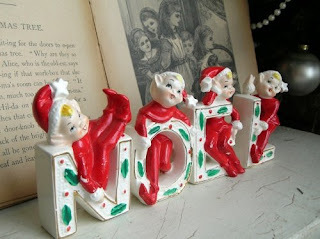 He nodded toward the bookcase across the room to four red ceramic elves. Their mocking faces were almost pleading for my touch. I quickly got up, rearranged the elves to spell out “LONE” and sat back down. Within minutes Mama was home and the elves were forgotten. As I left for home on Christmas Eve, I hugged Daddy and Mama and looked over Mama’s shoulder to see that the elves were still in the positions I left them. I went home victorious that year, with a little help from my Daddy. He is gone now and Mama isn’t sure what ever happened to the “NOEL” elves. I would love to have them, to place them on my mantle, always spelling “LONE” just because of the silly memories of my childhood. I wonder how many years Daddy knew it was me moving the elves? That disciplinarian Daddy, who made me walk the straight and narrow, turned his head for all those years to allow me that piece of fun. So, in the spirit of the season, here is wishing you wonderful memories of “LONE”. We had a set of these in my house too. We never played such clever games with them however. Recently I gained possession of these treasures. I wondered how many sets of these cuties were around. I don't think they were expensive when originally purchased but do they have value now? I found 3 or 4 images of them on the net. Some were like yours and some were items for sale. I found one set for sale in the exact same box mine are in! There are at least 2 or 3 designs. Mine aren't exactly like yours. My set has the guy in the 'o' leaning out through the 'o' like it is a window with both arms spread out. Happy Holiday Memories to all!